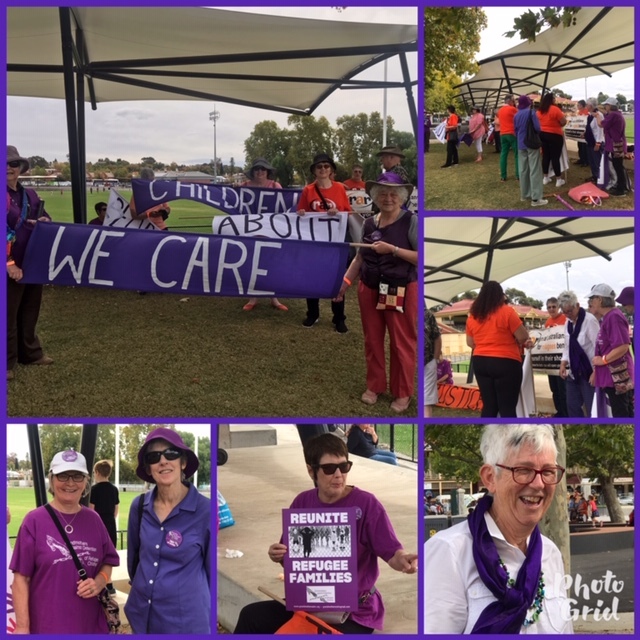 Bendigo Grandmothers participated in the annual Easter parade again. Huge crowds this year and we got a warm welcome. Definitely sensed an even stronger support than last year.Here’s hoping that converts into wise voting behaviour. What stands out is that for the first time in years, New Zealanders are not the largest group in detention. This time they are pipped at this post by Iranians by only two extra people. What is also clear is that Home Affairs and ABF have maintained a constant bed occupancy of 1200- 1300 human beings in locked detention for the past three years. They have been able to do this, even though no one has arrived onshore by boat, by creating new avenues for detention. The question re occurs as we look at the statistics as to whether the SERCO contract (private-In-Confidence) requires a certain bed occupancy to ensure profitability. The number of people in detention who are refugee cleared, health and security cleared and who await years for the Minister to release is an ongoing tragedy. The population is made up of roughly 1/3 people seeking asylum by boat or air, 1/3 visa cancellations for character or other reasons including that Bridging Visa was not renewed in time by Immigration bureaucracy, 1/3 other including over-stayers. Five children including one born in detention and a 7 year old boy from Nauru continue to be detained at the Ministers pleasure.